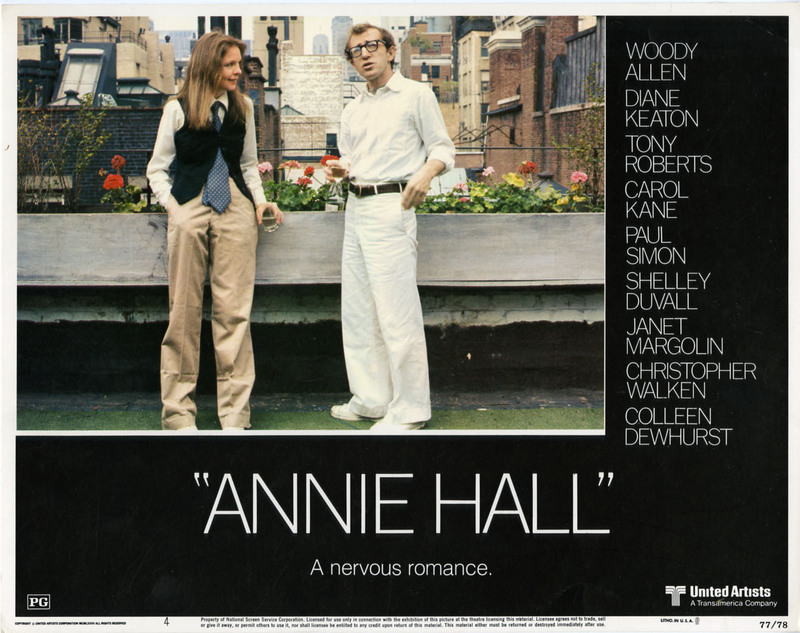 GUEST POST: My mom reviews Annie Hall! In 1977 the Woody Allen film Annie Hall was released. I was twelve years old in 1977. Throughout the years I often heard references made to the four Oscars that the film won (which included Best Picture). I also recall hearing much in regards to lead actress Diane Keaton’s Annie Hall sense of style, but I never viewed the film until tonight. I first became familiar with Woody via Midnight In Paris and have since seen several other works of his which are all well done. Annie Hall does not disappoint. Woody is brilliant – his movies are timeless, insightful, and intelligent quirky comedies. Annie Hall is the story of comedian Alvy Singer (played by director Woody himself) and his various relationships and neurosis, the main focus being his connection with Diane Keaton’s character, Annie Hall, and his apparent inability to maintain a commitment. As with most of Woody’s films (at least the ones I have seen) there are many well-known faces throughout Annie Hall including Tony Roberts, Paul Simon, Christopher Walken, and Colleen Dewhurst. During the scene with the lobsters, Annie grabs a camera and begins taking pictures. 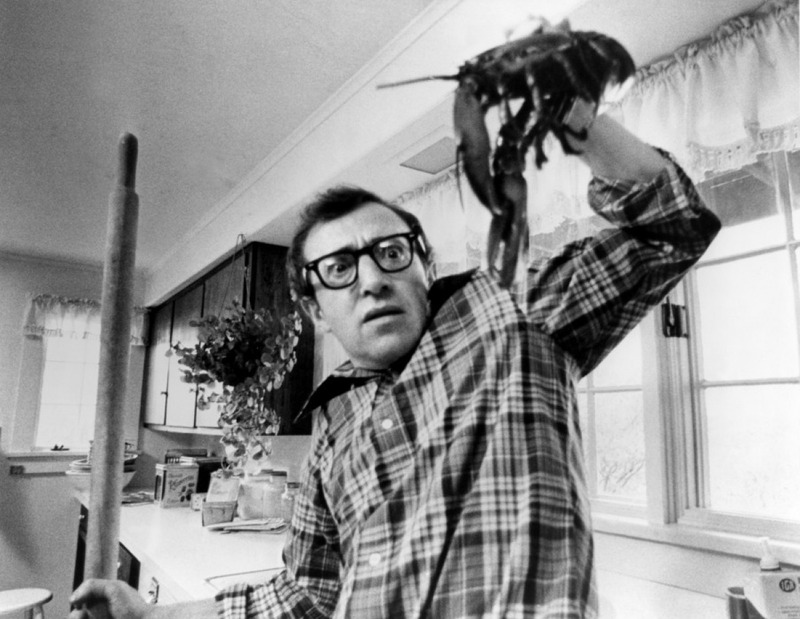 Those pictures are later shown on the wall at Annie’s apartment, when she calls Alvy over to deal with a spider “emergency.” The lobster scene was also the first scene to be shot. Sigourney Weaver makes her screen debut in this film. She has a non-speaking role. The film also serves as Shelley Hack’s debut. The outfits worn by Diane Keaton, which became famous, were actually Diane Keaton’s own clothes. In a flashback, a teacher writes “Tuesday, December 1” on a chalk board. December 1 is Woody Allen’s birthday! The man who Alvy says is “the winner of the Truman Capote look-alike contest” actually IS Truman Capote, in an uncredited cameo. AFI listed Annie Hall as #2 on their list of 10 greatest romantic comedies. The house underneath a rollercoaster, which is Alvy’s childhood home in the film, is actually Coney Island’s Kensington Hotel, which has now been demolished. Kay Lenz was offered the role of Annie but turned it down because David Cassidy (y’know, Keith Partridge), her boyfriend at the time, didn’t want her to take it. Paul Simon has a role in the film, and his song “America” serves as the basis for the scene in which Alvy and Annie make up stories about people in the park. The film is largely based on Woody Allen’s relationship with Diane Keaton, but the character of Annie was also inspired by his ex-girlfriend Judy Henske, who was born in Chippewa Falls, Wisconsin — just like Annie. Woody Allen’s films are always entertaining and creative. You can tell how much thought and work goes into the making of them. In the case of Annie Hall, many methods were utilized to keep things interesting such as animation and subtitles. I like the sort of documentary feel that many of Woody’s films, like this one, have. Something about them makes the viewer feel as if they’re catching a glimpse of someone’s real life in all of its craziness and oddity. I give Annie Hall a score of 5/5. Nice work, Lindsey’s Mom! I’ve only seen this once, and that was ages ago…and I’m a Woody Allen fan, too, so there’s no excuse for me neglecting this for so long. Now, after reading this review, I’ll make it a point to watch it again. One question: Why was Kay Lenz taking career advice from DAVID CASSIDY?! I know he was her BF, but we’re talking Woody Allen! A great film and equally great review! Have you or your mom seen “Scoop”? I believe that it’s one of Woody’s best films that gets overlooked among his more recognized classics. Yes, Scoop is one of our favorites!